Interesting. Has this happened more than once? Was there a stacktrace or error of sorts? Are you using the latest 1.4 version? Is your MySQL server responding correctly? (Or.. is your SQLite file locked by another process.. such as a database editor?) Was there a conversion recently? Does it lock when you start it up and reboot immediately after? 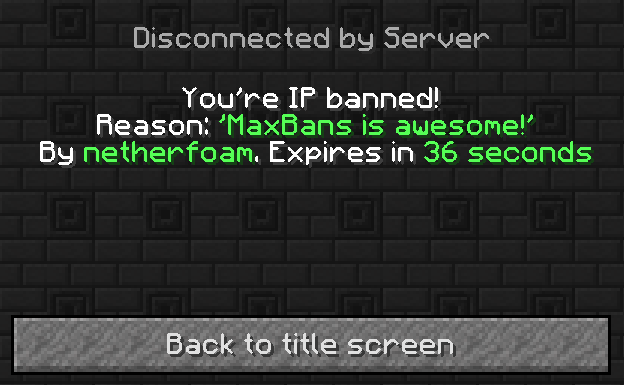 Server locks up at disabling maxbans when i shut down. Yea I was not trying to go on a "witch hunt", just that MB was the only plugin to throw an error prior to the crash. I believe it was only around 20 accounts were spammed before it died, that was the crazy part. Once again thanks for your quick reply's and help. Hopefully it works, I've rewritten it to use synchronized blocks instead of a lock boolean. It seems there was a query that was null in the list of queries, which really doesn't narrow anything down. How many logins were you dealing with per minute? Tens, hundreds? I'll work on a fix now. The last packet successfully received from the server was 585,052 milliseconds ago. The last packet sent successfully to the server was 0 milliseconds ago. 2013-02-26 15:12:12 [SEVERE] Caused by: java.io.EOFException: Can not read response from server. Expected to read 4 bytes, read 0 bytes before connection was unexpectedly lost. 2013-02-26 15:12:12 [SEVERE] [MaxBans] Could not update database! I'll see what I can do about adding it in. The warnings system for us is more of an anti-rage system... Folks calm down after an hour, but we give it out like free coupons. I don't think I'll add a cap where players should be perma banned. Possibly, I can set it to execute a given command on hitting the warnings, but otherwise I won't make this possible. Great work! Best banning plugin I've used so far. I like how it doesn't use any sort of web services and it's stable + lightweight. I wouldn't mind seeing a feature where I can customize the length of the ban after reaching max warnings (I would like it to be 3 days since 1 hour is a bit wimpy). Also, maybe after max warnings have a ban-max-warnings where if for instance a player gets tempbanned and comes back and still gets more warnings then he or she will be permabanned. Plugin has only been on for 3ish weeks. Sounds great! Since there is a new ban, will this require a fresh DB since it's adding another table, or will it just add the table into the sqllite I already have? I assume it will just add the extra table, bust just wanna make sure. "Does anyone even read this, to be honest?" Yup I do, I hate updates with no or bad change logs. Much rather; Upgraded to gigawatts compacter codding engine, 28.94% faster lookup on bans. Now using magnets to pull info from the database. Added a unix ano herpaderpa shield to repeal multiple attacks on a server. Rather then; Made it go faster. Or just nothing.